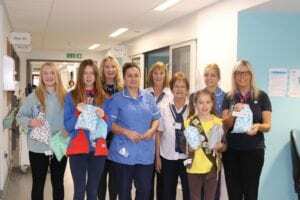 On October 26th, Ellie, Roisin, Gabriella and Flouragh from 1st Bramhall visited the Acute Medical Unit at Stepping Hill along with their leader Liz Kay. 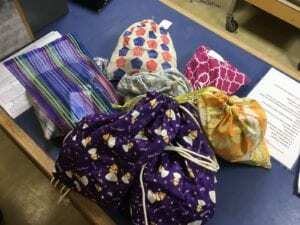 There they met Yvonne, head of volunteer services and volunteers and staff who have been giving their comfort bags to patients. Yvonne thanked the girls for their support on behalf of Emma Rogers – Matron for Patient experience. To date a total of 139 bags of the proposed 1,000 have been delivered to the hospital – many of which are already in use.